Our trained pond technicians stand alone in their ability to diagnose, repair, and maintain your pond so that it remains in its top condition. Their years of experience allow them to handle ANY task, big or small! We offer one time, seasonal, or regular scheduled programs! Maintenance is the key to maintaining a healthy pond environment. Without proper maintenance, a pond’s ecosystem will degrade over time, robbing the pond of it’s natural beauty and splendor. Unfortunately, many pond owners lack the knowledge or experience to keep their pond in top condition. With this in mind, Splendor Koi and Pond is happy to offer custom maintenance packages to fit every schedule and budget. We’ll make pondkeeping easy so you have more time to relax and enjoy your place of splendor. What does pond maintenance include? 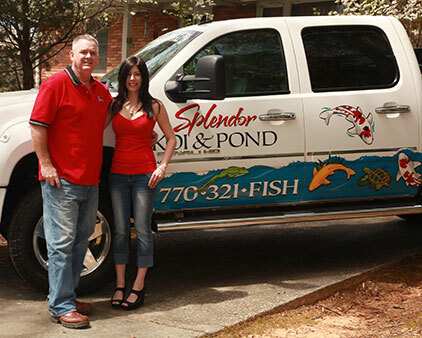 No two ponds are alike, and every pond owner has different needs and expectations for their pond. Because of this, creating a maintenance plan with Splendor Koi and Pond always begins with an on-site evaluation of your pond and personal schedule. This visit allows us to assess what kind of work the project entails and what schedule and budget and schedule we have to work with. We will perform some preliminary measurements of the pond, in order to estimate the cost of labor and materials, and will work with you to schedule an appointment time. Even if you choose to maintain the pond yourself, Splendor Koi and Pond will give you the information and materials you need to do the job right. When our crew arrives, they will begin with a thorough visual inspection of your pond and fish. Our pond crew is trained to recognize any and all signs of equipment malfunction, pond leakage, damage and fish illness. We will discuss any concerns with you and address them if desired. 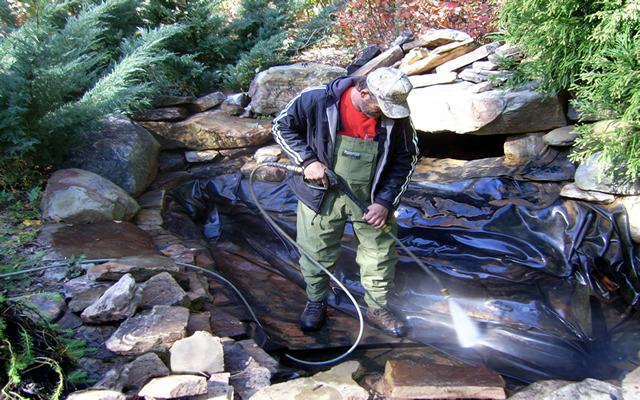 Water testing is an extremely important part of any pond maintenance routine. A vast majority of fish illnesses stem from poor water quality. We will perform a complete analysis of your pond’s water chemistry, which includes testing the PH, KH, Hardness, Ammonia, Nitrate, Nitrite, Copper and Salinity levels of your pond. If these variables are not in perfect balance, we will provide the treatment necessary to keep your pond’s ecosystem healthy. The top and sides of your pond will then be scrubbed free of any debris and algae, along with a thorough cleaning of your filter. Not only will this help maintain the clarity of your pond, it will also keep the filtration system from clogging or malfunctioning. Finally, the most important part of any pond maintenance routine: the water change. Your pond will be drained, either partially or entirely, to remove the old, dirty water from it. The new water will be treated with the appropriate chemicals to keep it clean and safe for fish, and the pond will be refilled. We offer maintenance plans to fit all schedules and budgets, including one-time, weekly, monthly, seasonal and yearly visits. Our maintenance plans are non-contractual, so you can cancel or reschedule at any time. Our services are 100% guaranteed! To schedule, call 770-321-FISH today! Contact Splendor Koi and Pond today and let us help you maintain your very own place of Splendor.